That’s a challenge I would like to do. I’ve never asked to fight anybody, but I would like to test my martial arts skills against Conor McGregor. I would like that and a rematch with Nick Diaz and Michael Bisping. 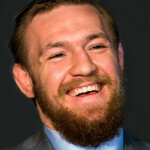 I think McGregor is a great striker, but he didn’t do very well in his last fight because he played into Nate Diaz’s game and that’s really hard. The Diaz brothers have a lot of gas. You have to respect him, the loss to Diaz doesn’t diminish his career at all. These are the fighters I would like to fight. McGregor, Diaz and Bisping because that fight did not end nicely. Justino credits McGregor for being able to fight in a UFC weight classes, which had a maximum weight of 135. Justino fights at 145, but will drop to 1450 for her upcoming fight against Leslie Smith. I think [Conor] McGregor opened the door for this. He’s fighting at different weights. He [sold] a lot of pay-per-views and it opened the opportunity. I think the UFC sees the great opportunity and it’s a great time…I’m really happy for the opportunity and I’ll do my best in Curitiba and of course I’ll try for the KO and I’ll do my best…I think it will open the door for me for more fights at 140. Maybe I can fight Miesha [Tate] at 140 and Holly Holm and maybe Ronda [Rousey] when she gets off the pillow.